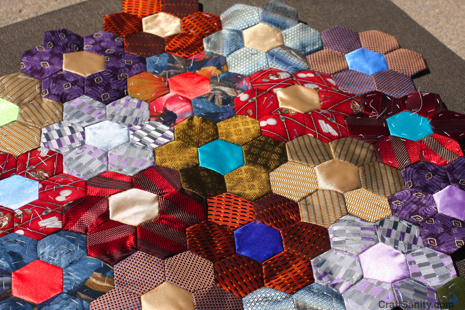 This is what my ArtPrize quilt looked like yesterday morning. 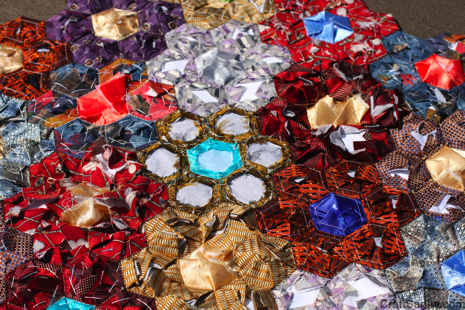 It was a box of 127 hand-stitched, paper-pieced hexagon blooms organized by color. 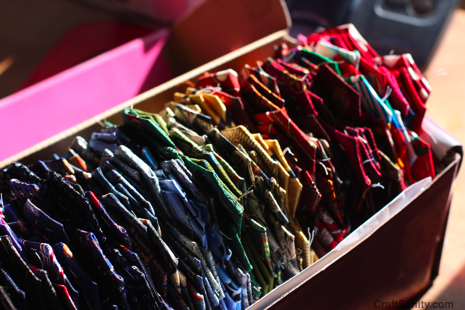 (Note that navy blue dominates this box of blooms created using ties donated by prominent men in West Michigan.) I stitched the last 14 blooms at 35,000 feet flying to Seattle and back. I’m not a big fan of air travel, so the project was a great distraction. I’ve been up late the last two nights stitching and working to create a cohesive designed using a completely random mix of tie fabrics. It’s been a fun challenge. In an effort to avoid going cross-eyed, I boxed up the blooms and headed to a friend’s house yesterday morning for a color consult and brainstorming session. The design of the quilt is still evolving which is part of the fun. (Above is a photo of the messy back of blooms that have been stitched together. This won’t be visible when the quilt is done, but I always find the reverse side intriguing.) I’m sewing it in smaller sections so I can manage it all without losing my mind. I’m try to working continuously on the project until it’s done because it’s important that I finish it soon to meet my deadline, rediscover the surface of my dining room table and resume my normal life. I kind of got swept away by this charity quilt project to benefit a local women’s shelter, at times neglecting to immediately attend to my family, business and other concerns. So I’m carrying a bit of guilt about the amount of time I’ve invested which is all the inspiration I need to finally GET IT DONE! Many thanks to my family for putting up with the messes I’ve made throughout this process and hugs to all people who have pitched in to help. Thank you so much! Okay, time to get back to work. I’ll post another update soon. In the meantime I’m going to focus on making the best quilt I can.